What you do every day matters. What you do every day matters. Your routines and habits set you in motion or bring you to a halt. They help you feel great or make you feel lousy. What you do on a daily basis has a cumulative effect on your life and has carried you to this very moment. Do something every day that makes you feel happy and healthy, and you can call it a practice. Do something every day that shifts you beyond your busy mind and wakes you up to your direct experience of being fully alive, and we’ll call it a Verge Practice. Practices are powerful when they’re done consistently. You can practice the piano or your golf swing. You can practice contemplative prayer, speaking the truth, or helping others. There are an infinite number of ways to practice. You already have practices; you just may not label them as such — yet. You do stuff every day that makes you feel happier and healthier. Practices come in many different packages. so that when I wake up early to write, my coffee is ready to be brewed. This simple routine really supports me. It’s a small but significant treat. It’s a way to be kind to myself, and it makes me feel happy. There is a sense of calm about people who have crafted empowering daily practices. You may know a few folks like this, those who seem to stroll rather than sprint, like your gracious neighbor who cares for her flower garden every afternoon or your easygoing colleague who walks after lunch, rain or shine. How about your consistently kind friend who wakes before her family to sit in silence every morning? Over the years, I’ve observed that poise and vitality seem to emanate from people who have established healthy daily practices. They somehow seem to be more productive, more engaged. They move through life with a calmness that makes them enjoyable to be around. They radiate a quality of excellence in the way they are living their lives. Though they may not realize it, these folks have learned ways to show up for their lives on a regular basis — they have discovered how to feel fully alive on purpose. I’ve been so inspired by the positive effects of my practices and in observing how daily practices help others that I’ve dedicated my professional life to helping people establish and stay committed to their own. I’m excited to help you do the same by introducing you to some of my favorite practices — the Verge Practices. Excerpted from the book On the Verge: Wake Up, Show Up, and Shine Copyright © 2016 by Cara Bradley. Reprinted with permission from New World Library. Cara Bradley is a leading authority of body-mind training having led thousands through her signature strategies to live in flow. She got to know flow as a competitive figure skater and pro skater for Rollerblade. 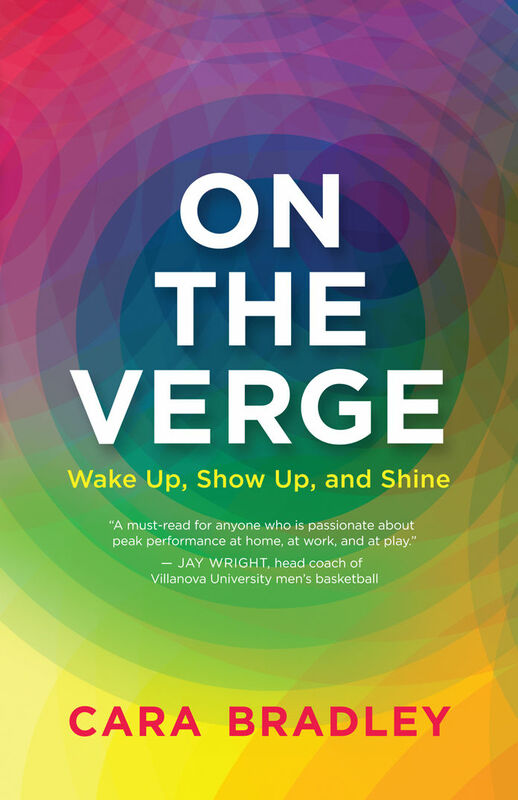 A nationally recognized body-mind teacher, mental strength coach and keynote speaker, Cara is the author of best-selling On The Verge: Wake Up, Show Up, and Shine, and the founder of Verge Body-Mind Center in Philadelphia. She trains CEO’s and Fortune 500 companies such as Coca-Cola, Wells Fargo, Spectrum, and Goldman Sachs and collegiate sports teams including Villanova Men’s Basketball team. Cara partners with Flow Genome Project, Happify, and Insight Timer.